The EX5 features a unique Extended Synthesis system which incorporates a number of advanced tone generator technologies. AWM2, AN, FDSP and VL. 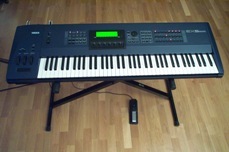 The EX5 is one of the best keyboard Yamaha ever produced. I have the chance to buy locally (and that is a big plus after my heartbreaking transport damage on my recently acquired SY77 ) an EX7 in excellent shape. Seller asks 400 EUR for it, which seems to me on the high side but, well, good condition is always a plus. I wonder if you can comment about what should I expect from an EX7, compared for example with my SY77, and what I would miss as my first goal was to get an EX5 but so far none has been available locally. I had another option, a well used MOX8, for just 500 EUR... But the physical condition is a big minus for me. I don't know why an answer to my post has just vanished! All in all, I am considering the local EX7 at 350€ (I have offered that and seller seems to have accepted) and also an EX5 for 590€ but it is far from here and, adding a hard case for it and then the shipping cost, go to a whopping 890€, which is far more than I want to pay. Well, the EX7 doesn't have all of the synth engines in the EX5, it looks like it's missing the VL engine, it has fewer keys (61), and is 64 voice rather than 128 (not that you use that many in a performance at any given time, unless you use the sustain pedal a lot). Personally I'd wait for an EX5 or consider a newer synth since you already have an SY77. It all depends upon what parts of the EX5 you really want. Sometimes posts are deleted due to spam Jose so I guess that is what happened here. EX7 is a nice keyboard of course but it kind of depends what you need that it has vs your SY77? EX5 is always the way to go if you can but that one you mentioned seems a little pricey to me, especially taking into account shipping etc. I would probably just wait it out for one to come up a bit closer to home. The EX7 has more limited DSP than the EX5, so a lot depends on how important the modelled voices are and their effects. If you want VL then it has to be an EX5. If you want AN or FDSP then the EX7 has more constraints than the EX5 all to do with the DSP count. The EX5 has two DSP and DSP1 is dedicated to effects for Global Reverb and Chorus, and the insert effects for a Voice. DSP2 can be used for an extra three insert effects in a Performance or the special voice modes: the AN, VL and FDSP permutations with AWM. The EX7 only has one DSP, so it has to be shared. It can be either as DSP1 in the EX5 for AWM voices (i.e. effects only) or if you are using AN or FDSP then you lose the insert effects as that block of the DSP is now used for voice creation. So, it really does depend. If your budget stretches to it, then it would be the EX5 or EX5R for me. full synth or rack? 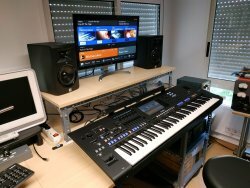 Do you need the 76 note keyboard, or will it be most likely to be studio based, where a rack would be fine. And the EX7 has a lesser keyboard. I mean lower quality (it has nothing to do with the number of keys). when you depress a key you have to overcome a certain resistance first, then it becomes lighter, giving the sensation of "throwing" the key, a bit like on a piano. That's a very pleasant sensation, very different from the "springy" sensation of ordinary synth keyboards on which the resistance is simply proportional to the depressing of the key. OK, so I am decided on EX5 or EX5R. Both have the SCSI card and at least the EX5R has a DRAM memory expansion. It shows DRAM: 34078720, FLASH: 4194304. Does that mean 64MB (i.e. 32MWords)? Thanks!. This helps to decide on the EX5(R). I like the SY77 and also the Genos keybeds, so something on that league is better than lesser keybeds. Another thing to remember is the in FDSP mode, polyphony takes a huge hit. The EX5 is 16 notes in FDSP mode and the EX7 is 8. So if you use FDSP a lot (as I do/did) then those extra notes matter a lot. Last edited by EXer on Mon Feb 11, 2019 2:19 am, edited 2 times in total. The EX5 does display in words, not bytes, so this looks like fully expanded DRAM and 8Mb Flash (which can be expanded to 16Mb courtesy of Sector 101 if you care to). Well, I did it again ... I have bought the EX5R I commented... and also the EX7 ! To make it short, the seller has took the EX7 to my home. I had set a pair of HS5 to test it. I received some days ago a Korg M1 and had it connected to the HS5 to test it. Then I have replaced it with the EX7... And, well, it was a complete different (and better) experience. It sounds deeper, more analog, so to say. Also, this EX7 is like new. It is a one-owner unit and has been cared and used only on his home studio. It is pristine! So I am wondering... Can an EX5R be fully controlled from a EX7?. That could be a good combo, as the real EX5 is a bit large for my setup. Almost. I run a EX7/EX5R combo, all the MIDI (knobs, keys & controllers) goes through my router perfectly. I cannot get the scene or number bank buttons to transmit to the EX5R; there may be a setting for the bank buttons to change voices, and play (?) If my arp is running wild it won't transmit--I use the arp on the EX5R. I have had the 7 for over twenty years now! I picked up the fiveR maybe ten years ago for a good price. I regret not getting the EX5 due to the better keys but my 7 is in perfect shape and its keys are way better than any reasonable controller these days. This has been my only synth. You may find editing difficult in the EX5R vs. 7. You can only change elements in certain screens making you jump back and forth constantly unless you know what you are doing! (I never figured out how to copy an element) On the 7 console you can use the number bank keys for a lot. And I have my 5r down to where my back is bent when editing. New post Purchase 3rd party perfs? New post LCDs backlights - any know of a source to purchase? 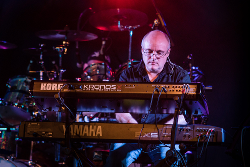 New post Would you purchase a Korg Kronos Rack version?